7 Strategies to Boost your Site Speed! 7 High-Octane Strategies to Boost Site Speed and Leave Competitors in the Dust! They teach fighter pilots “speed is life.” When you have speed, you can convert it into height anytime. This extra height gives you more time to think and act, which can save your life! I’m using this analogy because just like an aircraft’s speed, your site’s speed is critical for a great user experience and higher search rankings—speed into height! Faster site speed is crucial for faster business growth and can have a massive impact on conversion rates. Let’s look at some stats. Your site needs to be as fast as possible in today’s technological environment. A page loading time of less than 1 second would be perfect, though most websites can aim for 1 to 3 seconds. Here are the 7 high-octane strategies to boost your site speed and leave competitors in dust! Tweaking your site’s structure and page elements may be in vain if your hosting company lets you down. 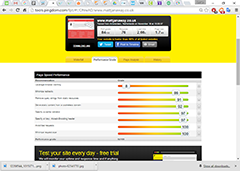 You’ll be surprised to know how many ‘famous’ hosting providers do a lousy job when it comes to speed. Remember the thumb-rule: cheap things are never good, and good things are never cheap. Venture Beat reports a more than 70% increase in site speed when they switched their hosting to a $29 plan. So, it may not be a such good idea to save $20 per month buying a cheap and slow hosting. How to Buy Quality Hosting? Compare the uptimes of different hosting servers using Netcraft, PC Magazine, or one of the uptime monitoring tools available online. If you have a resource-heavy website and an international or geographically widespread audience, you had better use a CDN or Content Delivery Network. It’s a hosting arrangement in which your static files are stored in data centers located closer to your visitors and your dynamic content is served from a central location. This can save you as much as 60% of your bandwidth and can as much as double your site loading speed. A CDN can also make your site more responsive during peak hours and protect you against DDoS attacks. How to Transfer Your Site to a CDN? Did you know 80% of the page loading time is consumed in calling different page elements like images, scripts, Flash, etc? An HTTP request is made each time a component is to be downloaded. The more the number of requests (i.e.the number of page components), the longer the page will take to display. How Reduce the Number of HTTP Requests? Google recommends reducing your server response time to less than 200 milliseconds. It’s the time taken to load the necessary HTML after a request is made from a web browser. Considering that you’ve bought quality hosting and have minimized the number of HTTP requests by simplifying your pages, the server response time will depend upon how you are using your server resources and how much traffic your website is receiving at a given time. How to Reduce and Monitor Server Response time? No matter how hard you try, you cannot reduce the number of components below a certain limit on pages that contain high-quality content—videos, images, style sheets, and script. The best way around this problem is to enable compression on your website. It means that the page components will be compressed or “zipped” when they’re being transferred from the server to the browser, accelerating the loading speed by as much as 70%. The compression feature is available in Joomla. You can enable it from Global Configuration > Server > Gzip Page Compression (set the option to YES). How to Enable Browser Caching? You’re in luck if you’re using Joomla, as you can simply enable browser caching by going to Extensions>Extension Manager and setting Caching to Yes. The code tells the browser what components are to be cached and for how long. For instance, you can define that a particular component expires in 1 week, which means that the browser should check for a new version of that component every week. Define the access time you define for any particular component based on how frequently that component is likely to change. For instance, you may be planning to change the hero image every week, but the logo may stay the same for a year. Everything said and done, your site may still not reach top speeds if you don’t clean up your code, optimize your images and CSS, and reduce the number of redirects and plugins. Yahoo!’s development team found out that about 20% of all web pages are viewed with an empty cache, so it’s better to adopt a minimalist approach. A clean and compact configuration saves bandwidth and speeds up performance, pleasing both customers and search engine bots. Don’t just take my word for it. This is what happened to our Google Analytics account a few weeks after we did all of the above. Faster sites make happier customers and wealthier businesses. Optimizing your site’s speed, like many other things, is not a job you do once and forget about. It should be permanently on your agenda. You are spending a lot of money on development, SEO, PPC, and other marketing activities that get people to your website. It would be a shame if many of those people left your website just because your pages are taking too long to load.